The Force is strong with the Irish Naval Service! 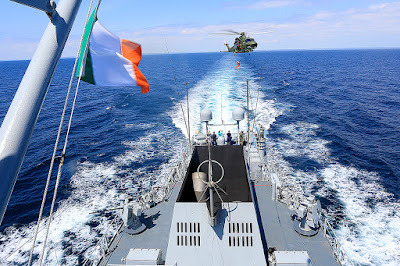 The Naval Service (Irish: an tSeirbhís Chabhlaigh) is the maritime component of the Defence Forces of Ireland and is one of the three branches of the Irish Defence Forces. 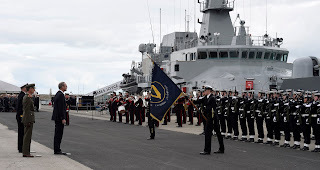 The Naval Service provides the maritime component of the State's Defence capabilities and is the State's principal seagoing agency. 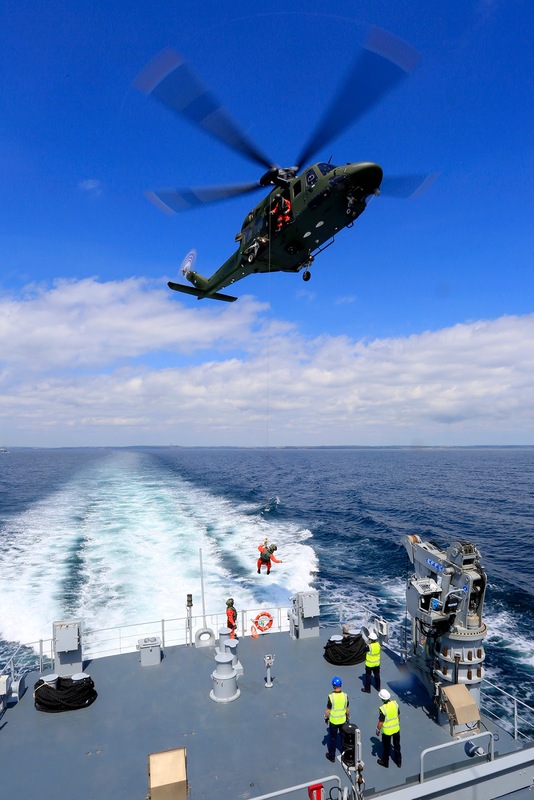 The Naval Service operates jointly with the Army and Air Corps. 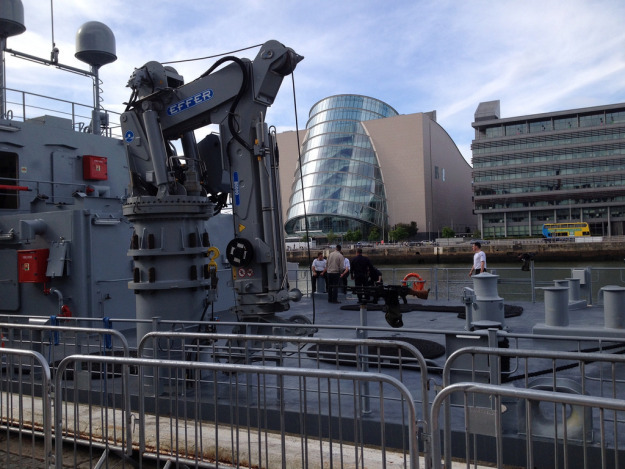 Its base is in Haulbowline, County Cork. 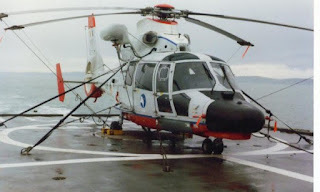 The Naval Service is tasked with a variety of roles including defending territorial seas, deterring intrusive or aggressive acts, conducting maritime surveillance, maintaining an armed naval presence, ensuring right of passage, protecting marine assets, countering port blockades; people or arms smuggling, illegal drugs interdiction, and providing the primary diving team in the State. 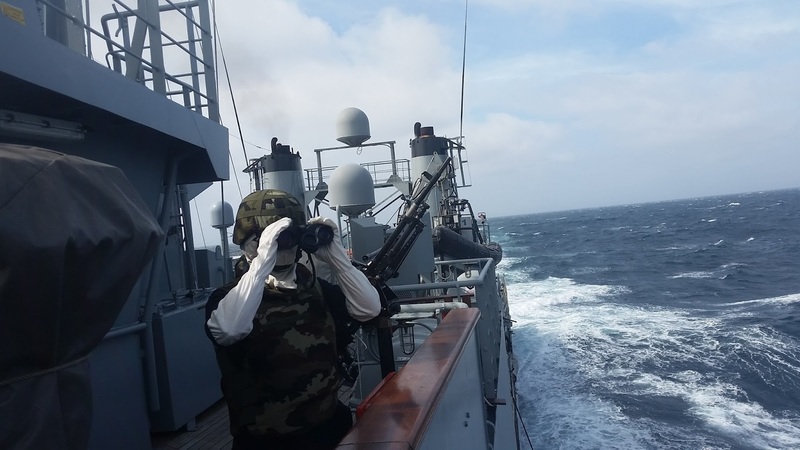 The Service supports Army operations in the littoral and by sea lift, has undertaken supply and reconnaissance missions to overseas peace support operations and participates in foreign visits all over the world in support of Irish Trade and Diplomacy. 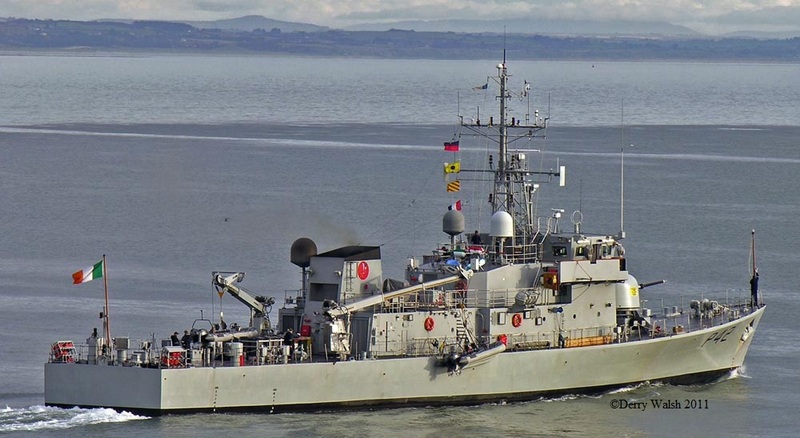 class (retired) and Roisin class offshore patrol vessels. As of May 2016, there are 1,094 personnel of all ranks in the Naval Service, plus approximately 150 in the Naval Service Reserve. 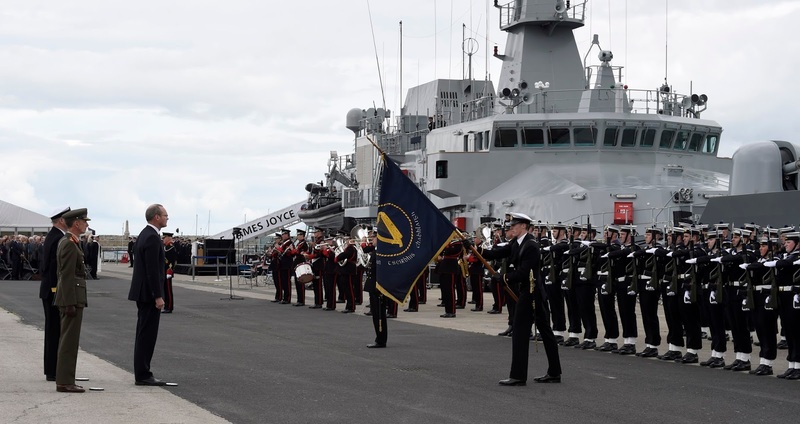 The Naval Service is headed by a General Officer Commanding (GOC) known as the Flag Officer Commanding the Naval Service (FOCNS), who holds the rank of Commodore. 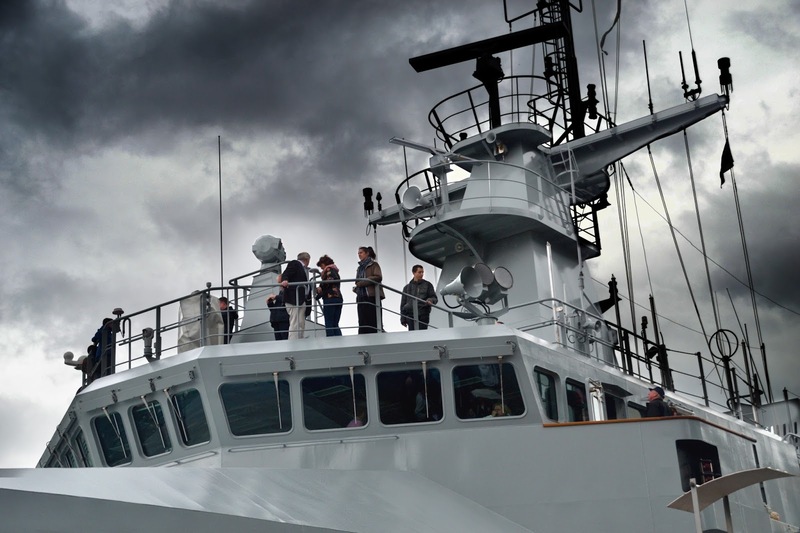 The current fleet consists of eight (8) patrol ships of which the majority is modern offshore patrol vessels. 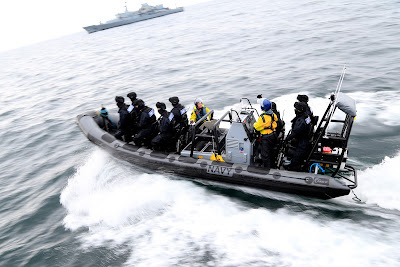 The Naval Service also operates smaller training vessels and rigid-hulled inflatable boats. 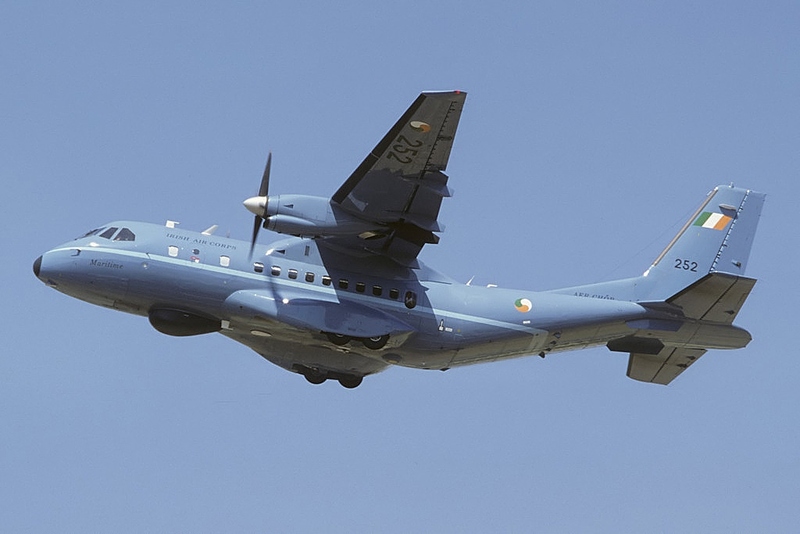 Air assets to support naval patrols are provided by the Air Corps with their two CASA CN-235 maritime patrol aircraft and six AW139 helicopters operated from Casement Aerodrome, Baldonnel, County Dublin. 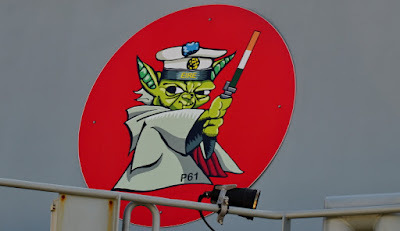 The ship prefix LÉ stands for Long Éireannach, "Irish ship" in the Irish language. 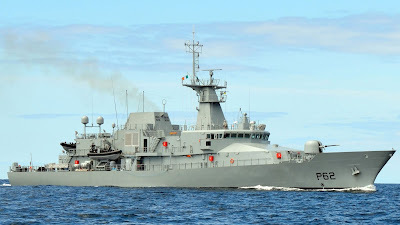 The offshore patrol vessel LÉ Eithne is the current flagship of the Naval Service. 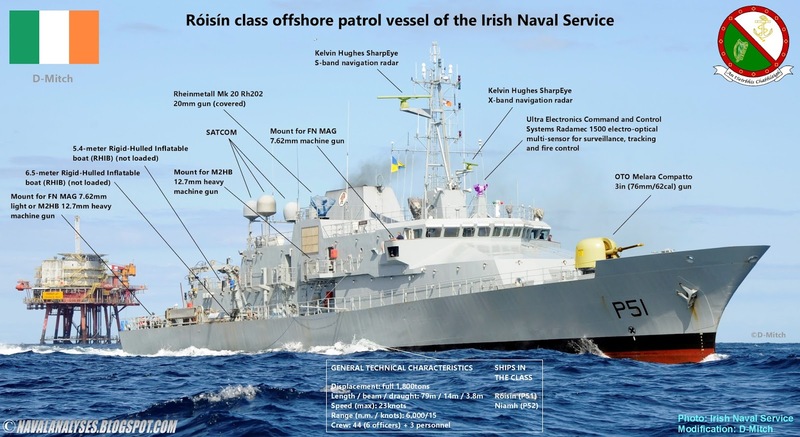 Until 2014, all Naval Service vessels were named with traditional Irish female names, taken from history and Celtic mythology. 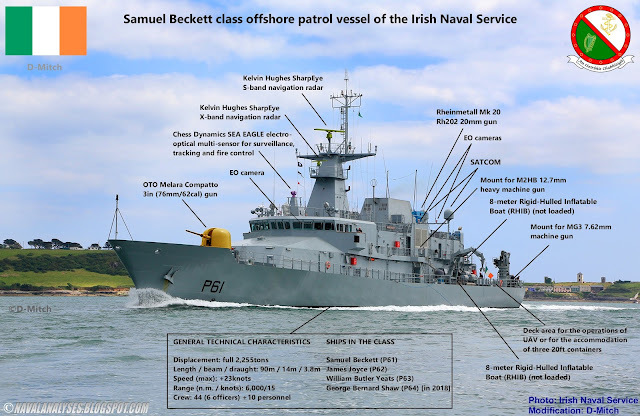 However, the three newest Samuel Beckett-class offshore patrol vessels in the fleet, LÉ Samuel Beckett (commissioned 17 May 2014), LÉ James Joyce (commissioned in September 2015) and LÉ William Butler Yeats (commissioned 17 October 2016) take their names from Irish literary figures. A fourth, to be named George Bernard Shaw, was ordered for delivery by 2018. 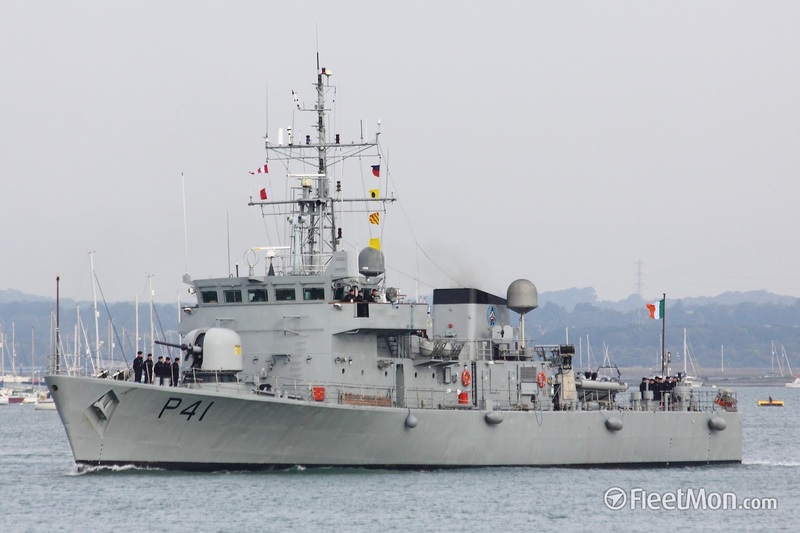 The Samuel Beckett-class OPVs replace the older Emer class patrol vessels. 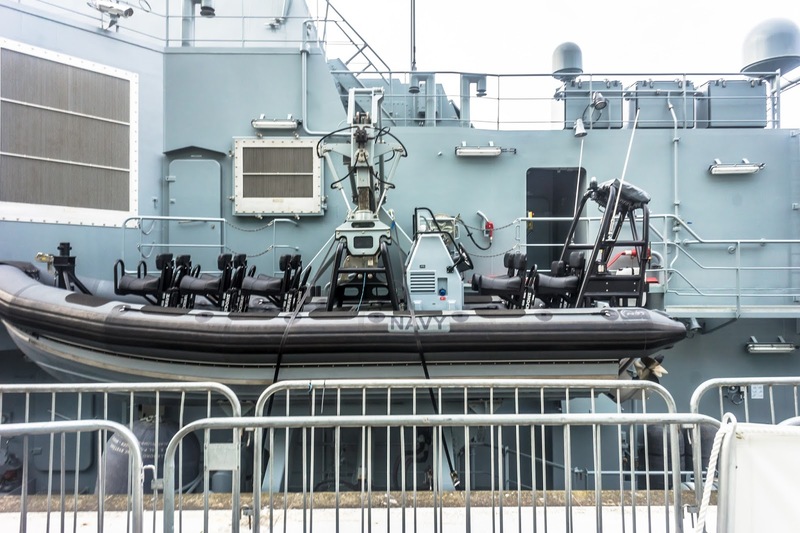 The Samuel Becketts are built and fitted out to the highest international standards in terms of safety, equipment fit, technological innovation and crew comfort. 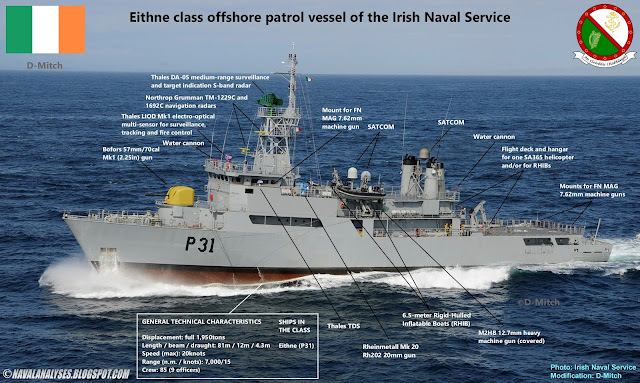 Modified photo of an Eithne class offshore patrol vessel of the Irish Naval Service. High resolution image here. The ships vary in size with the largest ones in the fleet, the new Samuel Beckett-class OPVs, an updated and more advanced design of the existing 80m-long Róisín-class vessels, having a 90 meters length and over 2,200 tons displacement at full load while the smallest ones, the two Peacock class PCBs having 62 meters length and about 700 tons displacement at full load. Modified photo of a Samuel Beckett class offshore patrol vessel of the Irish Naval Service. High resolution image here. The flagship Eithne is the only ship in Irish service with flight deck and helicopter hangar. 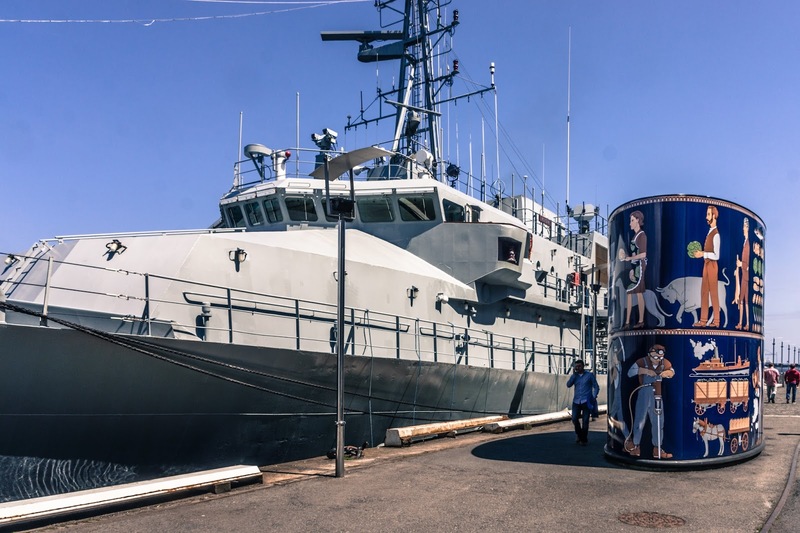 It was originally planned to order four vessels of this class, but budget restrictions prevented this. 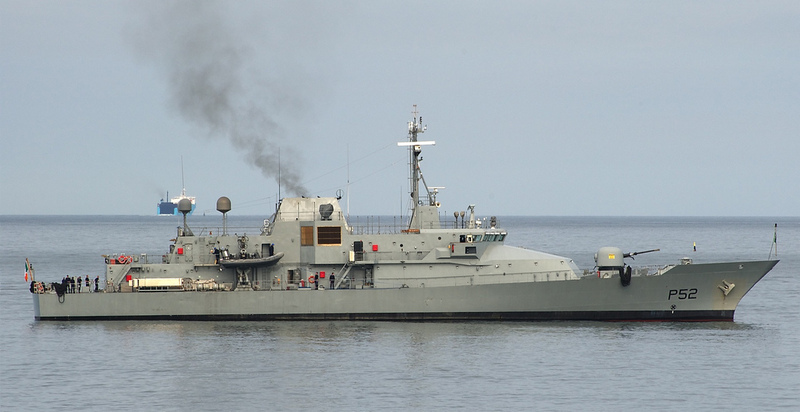 The ships is the only vessel also that it is equipped with a sonar, the hull-mounted Plessey PMS-26. It is also the only ship equipped with a Bofors 57mm gun (as a main gun) as the rest of the ships in the fleet are all armed with an OTO Melara 76mm gun. 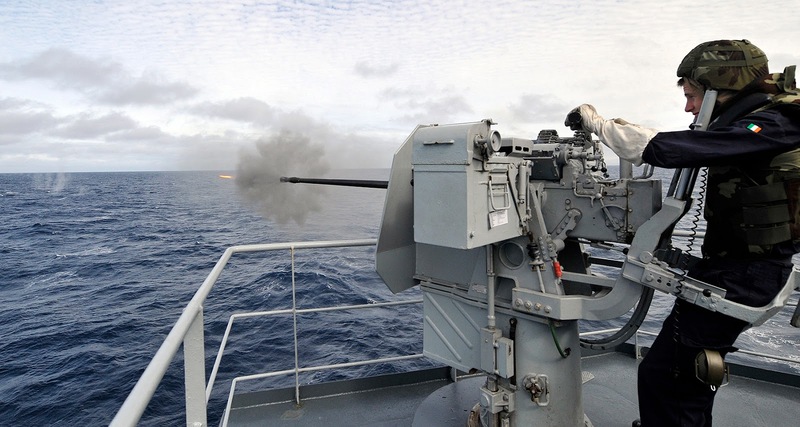 The Bofors 57mm L/70 Automatic Gun is an all purpose naval armament with a range of over 13km. 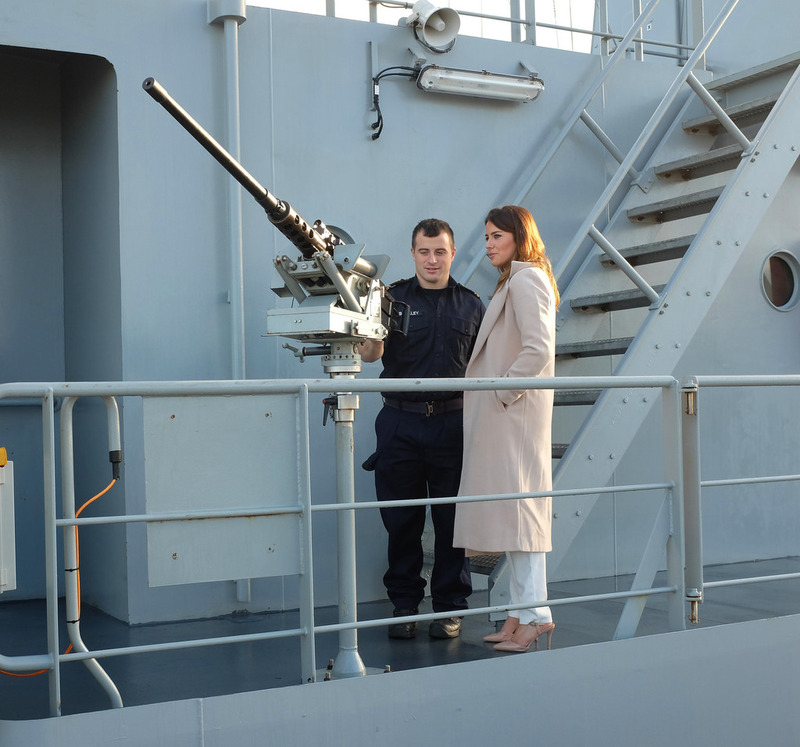 The gun is operated by a remote controlled optical and laser fire control system and is fully gyro stabilized to allow its employment at high speeds and in rough seas. 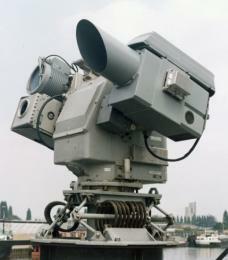 The Bofor 57mm is capable of firing 200 rounds per minute and is highly effective in the anti-air role. Modified photo of an Roisin class offshore patrol vessel of the Irish Naval Service. High resolution image here. 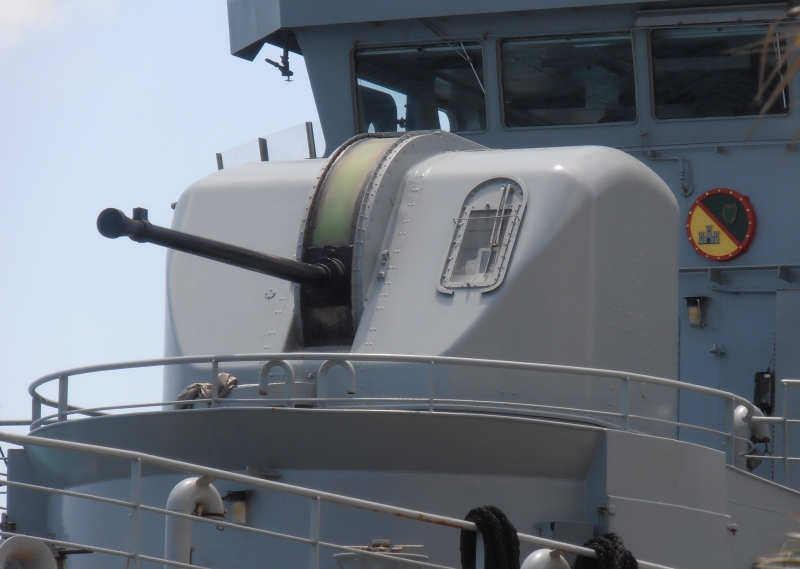 The rest of the ships are armed with an OTO Melara (now Leonardo) Super Rapido 3in (76.2mm) fully automatic gun installed forward of the bridge. 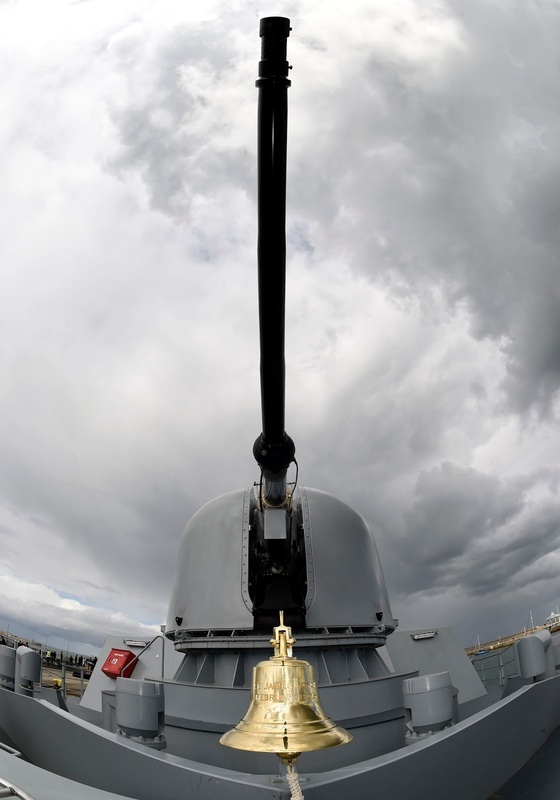 This gun can hit air and surface targets at a distance of 16km (effective range at 8km) and 13 km respectively with a rate of fire approximately 85 (100 rounds with a special retrofit kit) rounds per minute and weight of shell greater than 6 kg (12.34kg the complete round). Modified photo of a Peacock class offshore patrol vessel of the Irish Naval Service. High resolution image here. 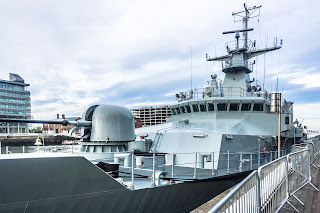 All the offshore patrol vessels are armed with two Rheinmetall 20mm Rh-202 guns, a precision close range naval armament with a high rate of fire of up to 1000 rounds per minute, a range of over 7km and high accuracy. The Rh-202 which is known also in German service as Mk20 gun, it is a very reliable weapon, gas operated with double belt feed and it fires single shots or automatic fire at 900-1000rds/min (ammunition in 200 round belts). The effective range is more than 2km. With a special mount design, the firer remains in the upright position for all elevations of firings. 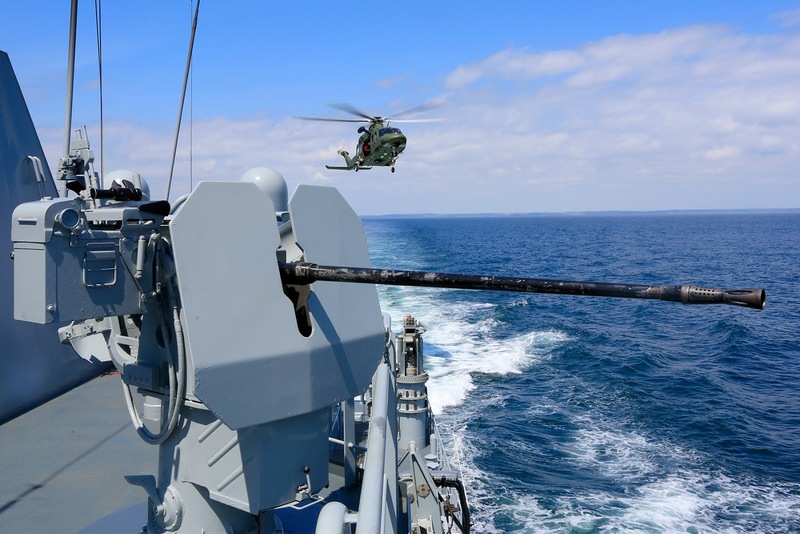 With a large variety of specialist ammunition the Rheinmetall is a capable secondary armament and is fitted onboard all Naval Service ships for close range weapons support and anti-air point defence. 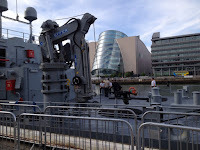 All the Irish vessels have several mounts for either M2HB 12.7mm heavy machine guns or FN MAG 7.62mm light machine guns. M2HB has a rate of fire approximately 550 rds/min with a range of over 2km while FN MAG has a rate of fire around 600-1,000rds/min with a maximum range of close to 2km. 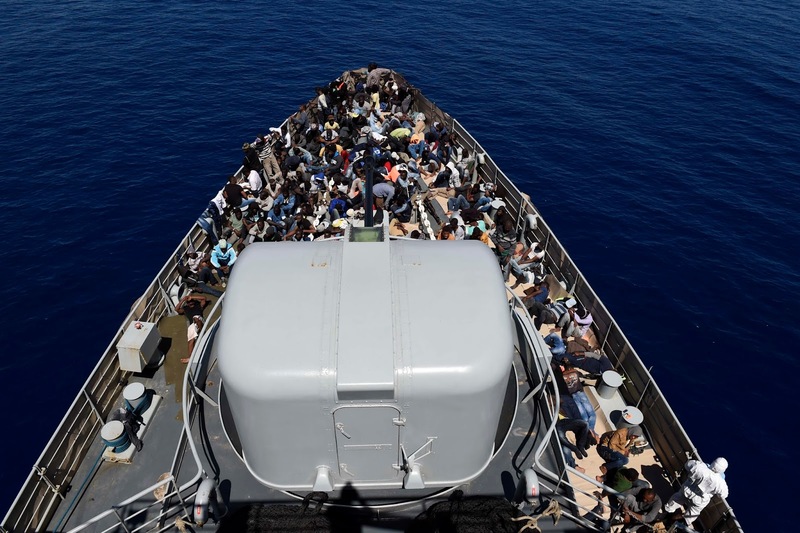 All the ships are equipped with a variety of satellite communication systems including VHF, HF, Inmarsat Global Maritime Distress Safety System (GMDSS) and Differential Global Positioning System (DFPS) and secure communications. Moreover, each vessel carries one electro-optical multi-sensor for surveillance, tracking and fire control. 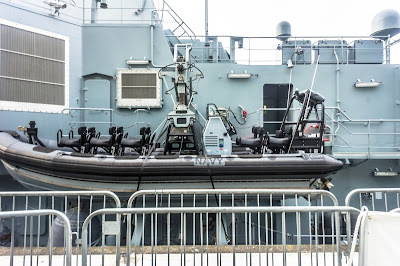 On Eithne the sensor (after her refit) is the Thales LIOD Mk 1 which is for automatic, optronic tracking of air, for surface targets and against asymmetric tactics such as piracy and insurgency. 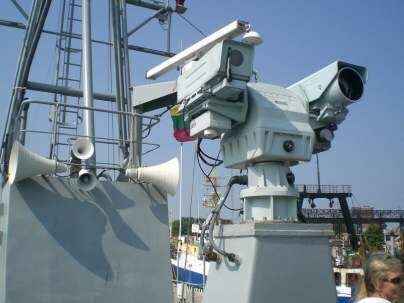 The basic sensor set consists of TV and IR cameras in combination with an eye-safe laser range-finder. It is a passive sensor, which are difficult to detect and completely insensitive to ECM. 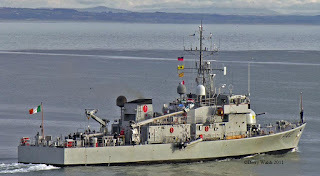 On Róisín class OPVs and Peacock class PCBs, the sensor is the Ultra Electronics Command and Control Systems, Radamec 1500 optronic director with a daylight TV camera, thermal imaging camera and eyesafe laser rangefinder. 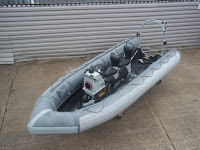 The system can detect a small patrol boat at ranges in excess of 7.4 kilometres night or day. 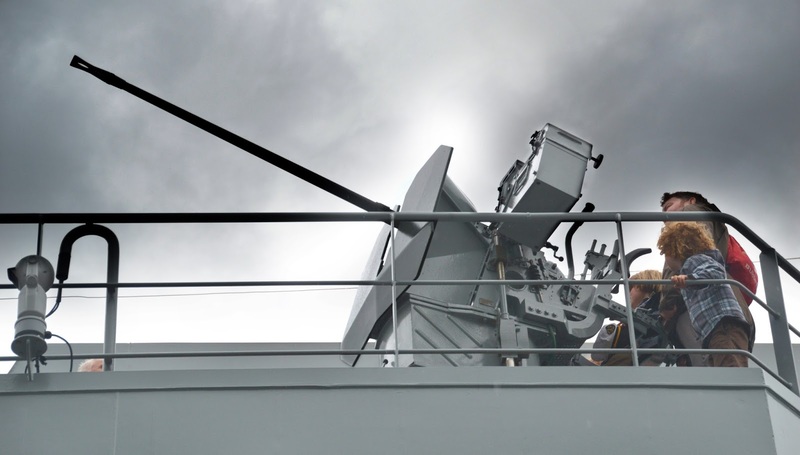 On the newest OPVs, the Samuel Beckett class, the sensor is the Chess Dynamics Sea Eagle FCEO which is optimised for the control of naval guns against air, surface and shore targets. 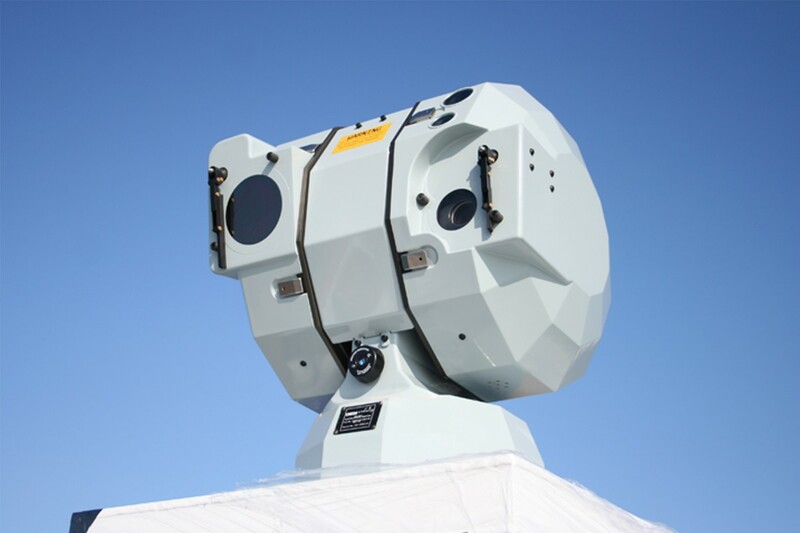 Capable of controlling any ‘in-service’ naval gun, the system provides 24 hour, detection, acquisition, tracking, identification and engagement of air and surface targets through its thermal and TV sensors with target range provided by a high repetition laser rangefinder. 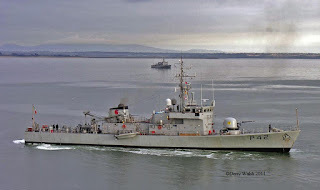 Τhe most modern patrol vessels in Irish service, the Roisin class (after a refit they were received) and Samuel Beckett class are equipped with Kelvin Hughes SharpEye navigation radars in S-band and X-band. 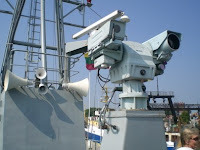 The SharpEye radar system represents a radical and innovative departure from current marine navigation radar technology in that it has no magnetron and uses a coherent transmission, making it capable of separating small targets from clutter due to their differing radial velocity components. The Samuel Beckett class have also the Kelvin Hughes MantaDigital workstations which is multi-function display platform that can host radar, ECDIS and conning functionality on a wide-screen display surface. 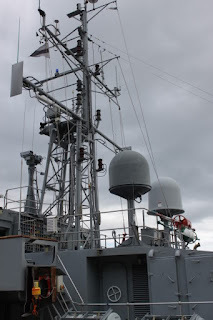 The single Eithne class OPV has a Thales DA-05 S-band surveillance and target indication radar, which is the most powerful radar in the Irish Naval Service today (it can detect a fight 135km away), along with Decca (now Northrop Grumman) TM-1229C and 1692C navigation radars. The two two Peacock class coastal patrol vessels carry a Kelvin Hughes 500A surface search and Mk.IV navigation radar. 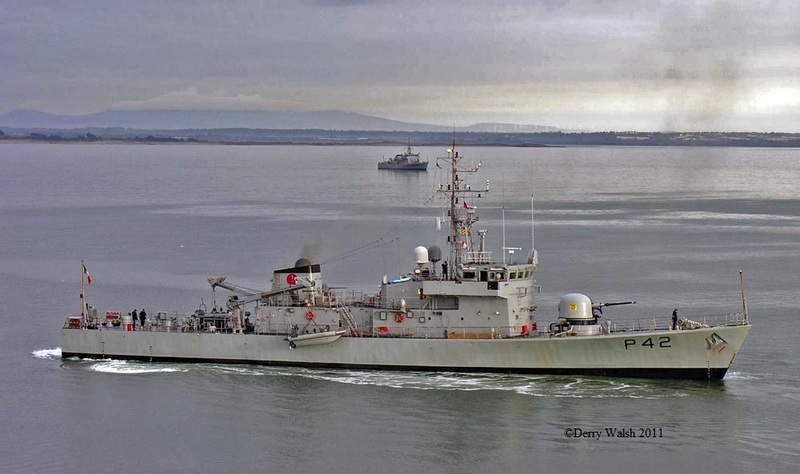 As it was mentioned earlier, Eithne was originally built as a Helicopter Patrol Vessel for long range fisheries patrol vessel, intended to be at sea for up to 30 days. 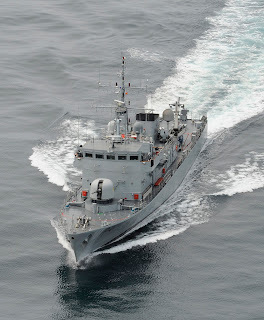 Eithne was designed to carry a SA365F Dauphin helicopter, and is the only ship today in the Irish Naval Service fleet to have a flight deck. 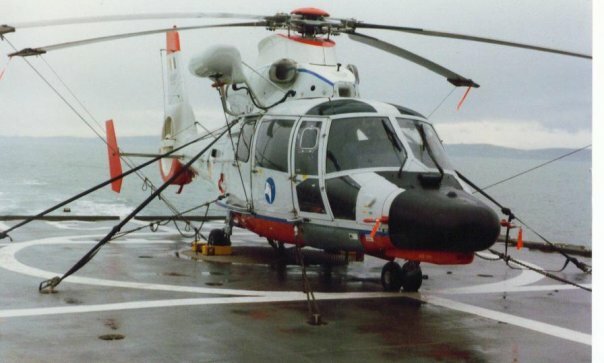 Helicopter operations have stopped in recent years, due in part to the purchase of CASA CN235-100MP Persuader Maritime Patrol Aircraft (MPA) and decommissioning of the Dauphin helicopters. 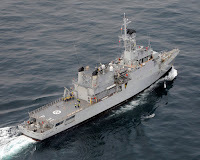 It should be noted also that the Samuel Beckett class OPVs have an expanded deck area at the stern that will allow in the future the Naval Service to potentially deploy unmanned aerial vehicles (UAV) for the first time.Currently, this deck can accommodate three 6.1m containers and is provided with a large 5t crane. All the vessels carry a large number of rigid hull inflatable boats (RHIBs). The Samuel Beckett class vessels carry two MST 8-meter RHIBs at either side of the hull, while a third MST RHIB is housed in a cradle over the stern deck. 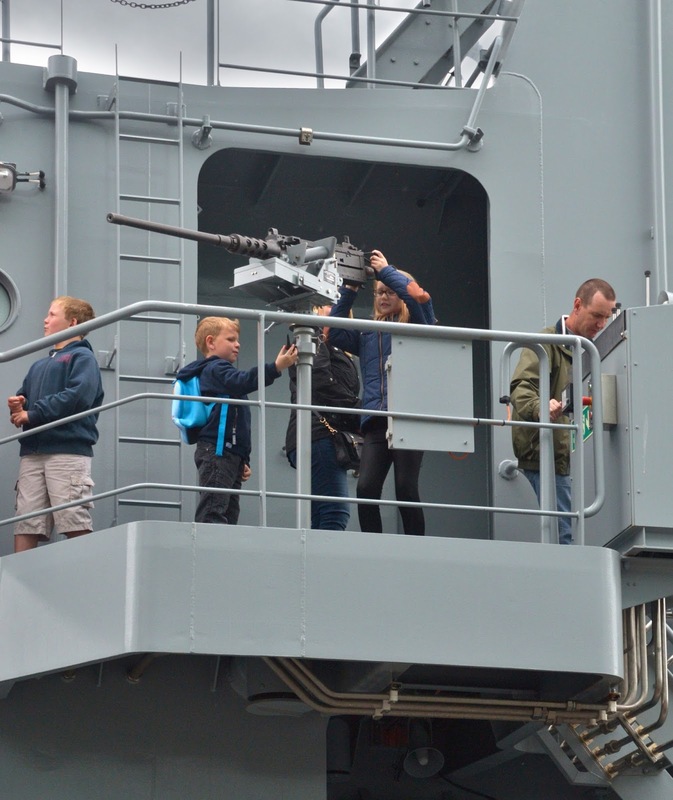 All the RHIBs have mounts for an M2HB heavy machine gun or FN MAG. 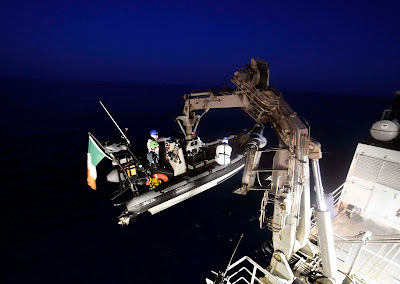 They are launched and recovered by single point davits. 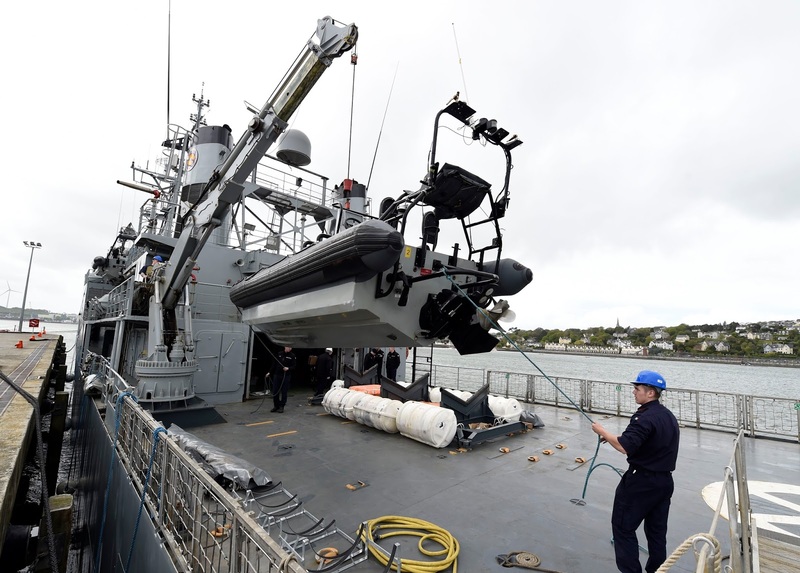 The Roisin class ships carry also two 6.5-metre Delta RHIBs launched with davits, and a single Avon 5.4-meter RHIB. The Eithne carry as well two 6.5-metre Delta RHIBs (these are newer than Roisins' and are are powered by an inboard engine) launched with davits and a third similar RHIB aboard flight deck. The Peacock class carry two Avon 5.4-meter RHIB each. 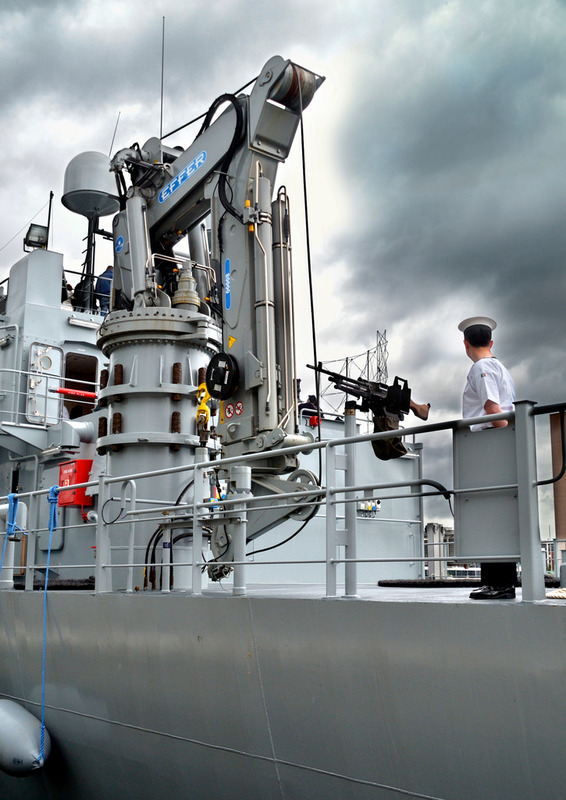 Keep in mind though that the RHIBs are interchangeable between vessels equipped with the Caley davits. 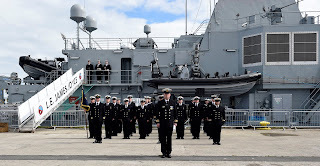 As it is mentioned in the official website of the Irish Naval Service, the vision of the Service is to be the smartest, most innovative and responsive Naval Service provider in the world. Therefore, the Irish government has issued a new White Paper that aims to modernise the Irish Naval Service (ISN) to include acquiring a multi-role vessel (MRV) and two new coastal patrol vessels (CPV). The paper on defence covers the next 10 years and encourages the use of the new ships for maintaining an eight-ship INS fleet as Ireland looks to play an increasing role on the international stage. 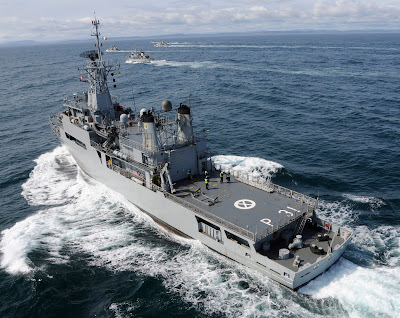 The new vessels will replace the single Helicopter Patrol Vessel (HPV), LÉ Eithne, and the two CPVs, LÉ Ciara and LÉ Orla, acquired from the Royal Navy in 1988 (they were modernized) and used primarily for inshore work. 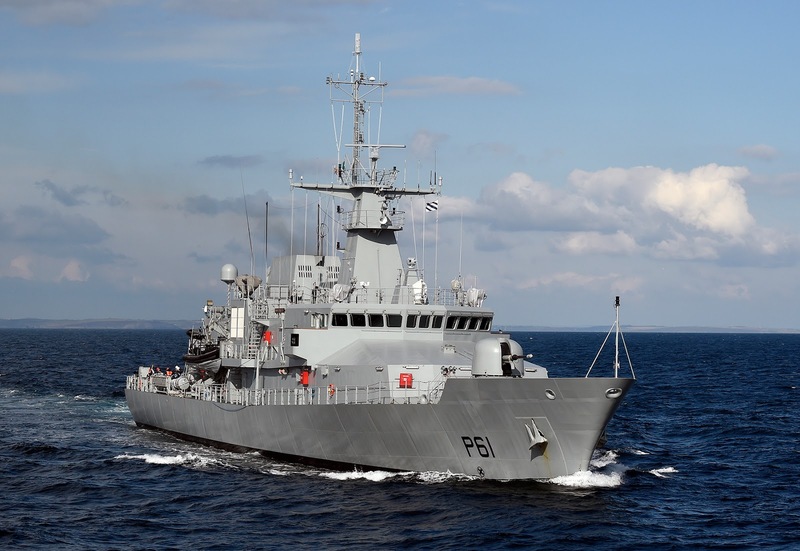 It is not clear if at the end LÉ Eithne will be replaced by the fourth Samuel Beckett class OPV which is currently under construction and will be named George Bernard Shaw. Plans expect that the two patrol coastal vessels, LÉ Ciara and LÉ Orla, will be replaced with similar vessels but with counter-mine and counter-IED capabilities. 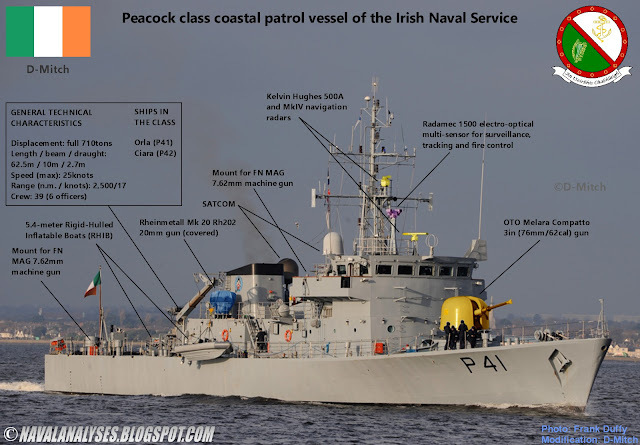 Therefore, in the near future, the Irish Naval Service will have eight very modern patrol vessels. The most of the photos (if not mentioned otherwise) were retrieved from the excellent Irish Defence Force's Flickr! 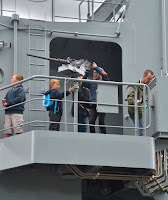 I think you got the range of the German 20 mm RH202 gun incorrect on your navy profile of the Irish navy. It can hardly be 13 km. 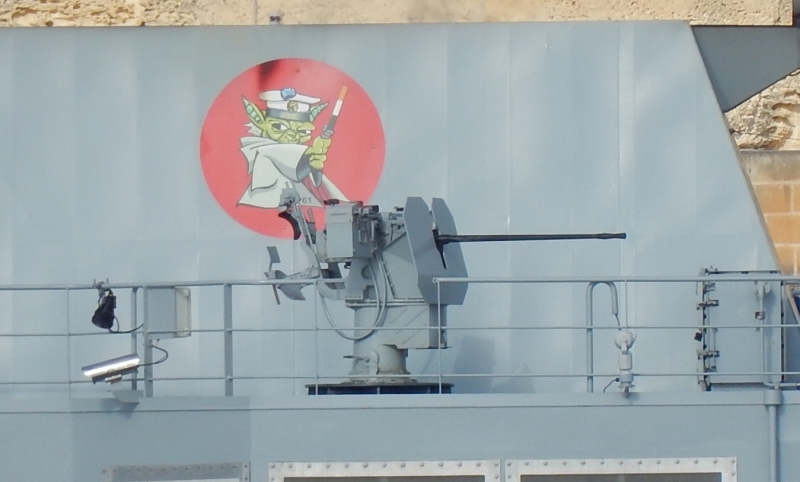 NavWeapons says "2,200 yards (2,000 m) effective". 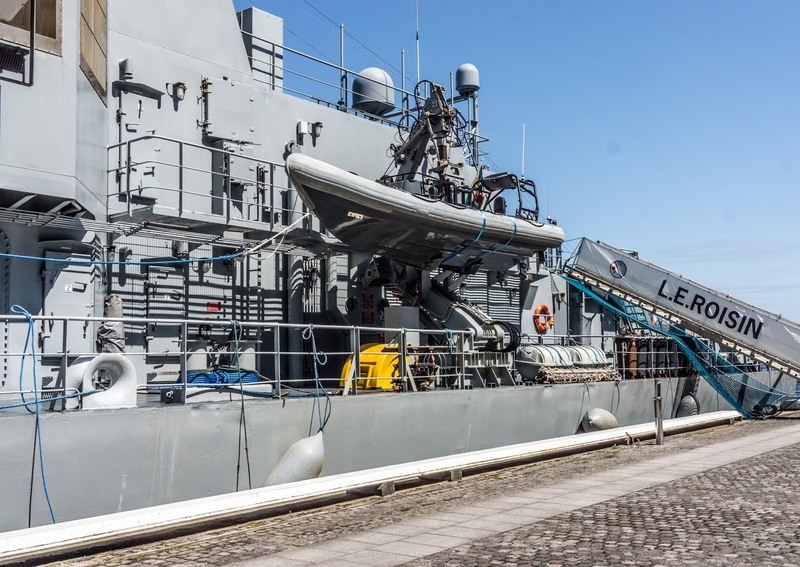 Also I would like to know whether there is any thruth that LÉ Eithne is built more to warship standard, and that the newer ships are more built to civilian standard? 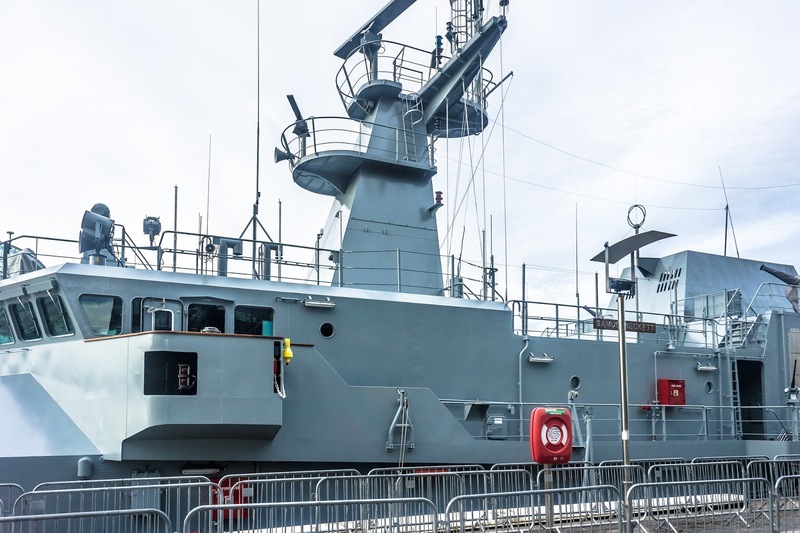 Last it will be interesting to see if the Peacocks will be transferred to the Philippine navy when they are decommissioned (to complement their three sisters). Indeed the maximum range is close to 7km, or at least this is the information I can find. There is a high probability that Peacocks will be transferred to an Asian Navy. Malta could be a possibility as well? ?